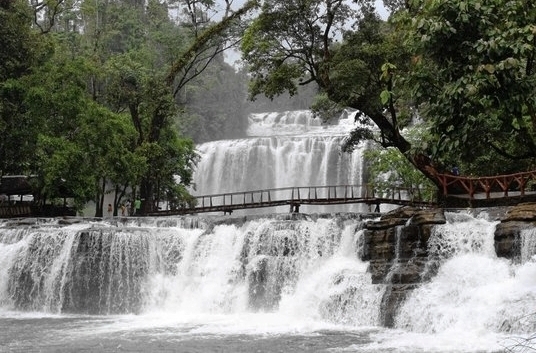 Tinuy-an Falls is one of Mother Nature’s most stunning gifts to the Philippines. This majestic 3-tiered waterfall is often referred to as the “Niagara of the Philippines” because of its wide water curtain. In fact, the waterfall is among the widest in country, measuring 95 meters wide and standing 55 meters high. Mother Nature does have her way of keeping her most beautiful attributes tucked away in remote areas, ensuring that these stunning features are preserved and kept intact as much as possible. Thus, if you wish to visit Tinuy-an Falls, you need to sacrifice some effort and time, allowing at least 1 hour journey from Bislig City’s center, Mangagoy. Set in a remote area surrounded by heavily forested hills, tourists who wish to visit the waterfall often have to endure a ride on the habal-habal. It may be uncomfortable but, the little sacrifice will be worth it. The unmatched views of the waterfall will keep you in awe of nature’s beauty and make you forget the habal-habal ride even for just a few hours, anyway. The lack of modern developments around the waterfalls coupled with its remote location ensured that Tinuy-an Falls is as close to its raw beauty as possible. There are some stores and cottages but no major developments in the area. The entrance fee is also very cheap. Just imagine paying a few pesos and already having access to this beautiful waterfall! Of course, you couldn't expect the place to have lots of choices in terms of amenities but what you’ll find there will surely suffice for the day trip. There are picnic tables spread along the banks of the river just a few meters away from the falls. Indulge in delicious foods while marveling at the scenic views right in front of you. The tables are available on a first-come first-served basis so early birds can claim the spot closest to the waterfall. You don’t have to worry even if you arrive late because the rest of the tables still afford you with lovely views. A small playground is also available for the kids to enjoy. You can get up close and personal with this lovely tourist spot at the main viewing area easily accessed via a wooden bridge. The bamboo raft allows more daring tourists to go closer to the main waterfall. Don’t forget to have your picture taken on the main viewing area, with the cascades at the background and foreground. If you’re lucky, you could even get a photo with the unique rainbow rays in the water! That would surely make you glad you took that habal-habal ride and have a one-of-a-kind photograph as evidence of your trip!